...1998 GMC Sierra 1500 truck 2 wheel 6 cylinder 4.3 Engine asking 2500.00 or best offer. 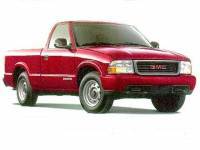 Reliable, 1998 GMC PICKUP TRUCK, V-8 Auto, runs & looks good. ...Please call for a showing @ Do NOT TEXT US. ...1998 GMC Sierra 1500. 85,000 miles, white. Body rough, transmission issues. Selling as is, $800. Pictures upon request.